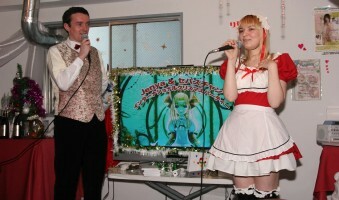 Jenya (aka Akiba Itsuki) and Sebastien Jarry had an event at a maid cafe (Tenpafe) on December 24, 2006. There was a singing stage at around 13:00, a public recording of their Internet radio show at 15:00, and one other singing stage (and bingo game) at around 18:00. Sebastien and Jenya were at the cafe the entire day, playing games and talking with customers when they didn't have the stage shows. Sebastien was wearing a shirt, vest, and bow tie. Jenya was wearing a red maid outfit for the first stage. She wore a skimpy black maid outfit for the second stage, and another different outfit for the third stage. I went just before 13:00, and stayed until 16:00 or so. Photos allowed (1000 yen for 30 minutes of photos).